Christmas is a magical time of year. There are lots of symbols around us that help us enjoy the festivities: snowmen, bells, candy canes, gingerbread men, stars, Christmas trees, Santa Claus, reindeer, and so much more. For young people, Christmas is more than just a season full of excitement, Santa Claus, Christmas trees and presents. Whether or not young people realize it, Christmas is also a time for learning: about the symbols of the season as well as learning to read the words attached to these symbols and why not also throw in some numbers. Although we might associate the number 12 with Christmas (the twelve days of Christmas), the number 10 also makes a good Christmas number. And then there are the colors of Christmas. For, after all, what would Christmas be without all the brightly colored lights and ornaments, everything needed to cheer us all up during the darkest days of winter. 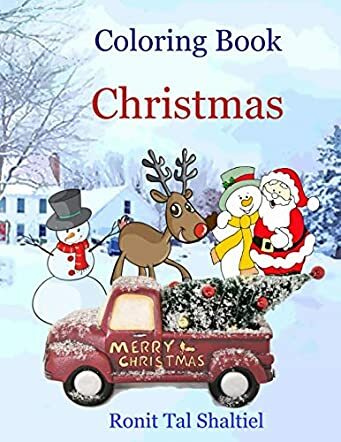 Ronit Gizel Shaltiel has created a wonderful coloring book for Christmas in Coloring Book – Christmas: Coloring and counting for kids ages 3-7, an inspired activity book. Each Christmas symbol is associated with a number. For example: 1 Snowman. The symbol is beautifully illustrated on one page. On the facing page, the outlines are given, allowing the young child to color it themselves, including coloring the word and the number. The child will then learn about the symbol of Christmas as well as how to write the word and how to write the number. This is an excellent learning tool to accompany the excitement of Christmas with an educational exercise.